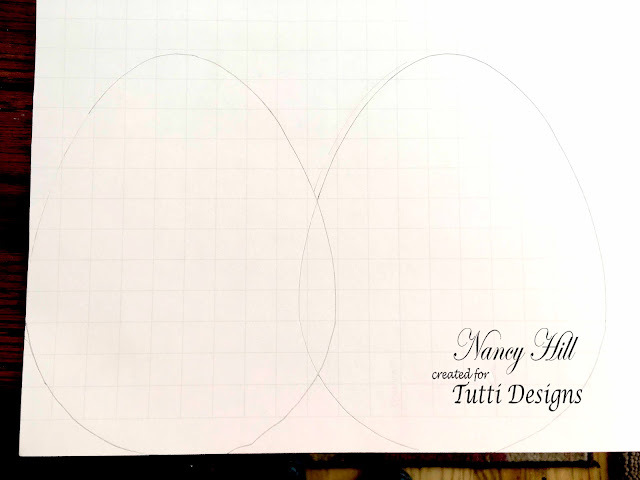 Hi, I am Nancy, Design Team for Tutti Designs. 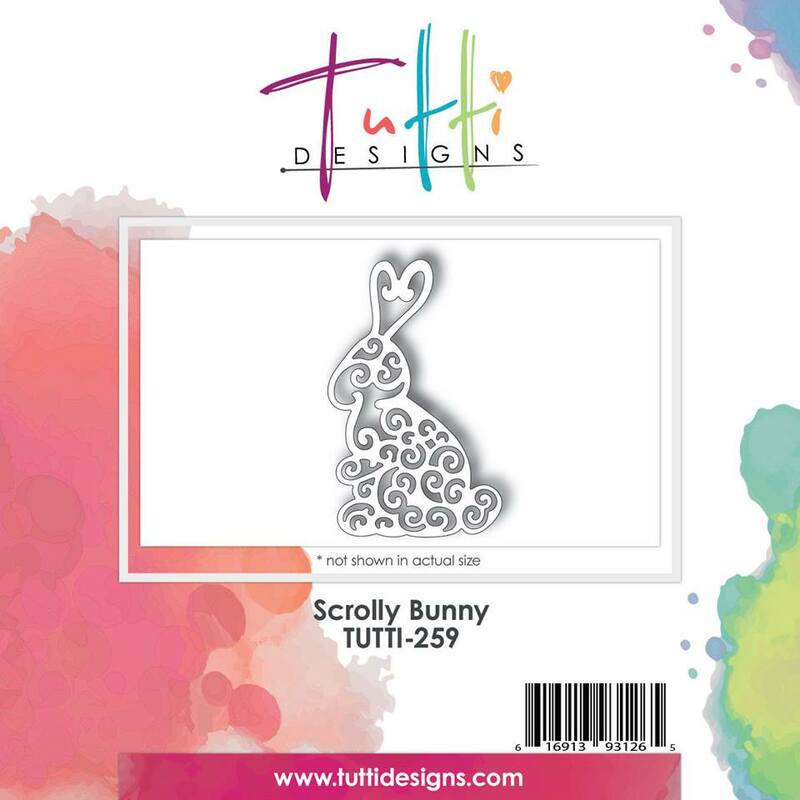 I am amazed of all of the beautiful dies from Tutti Designs and excited to share with you one of the Easter dies in the Tutti Designs' January release called Scrolly Bunny. I found this template on the web and used a photo editing software to enlarge it to 5" to 6 1/2". I copied the template on computer paper and cut it out. 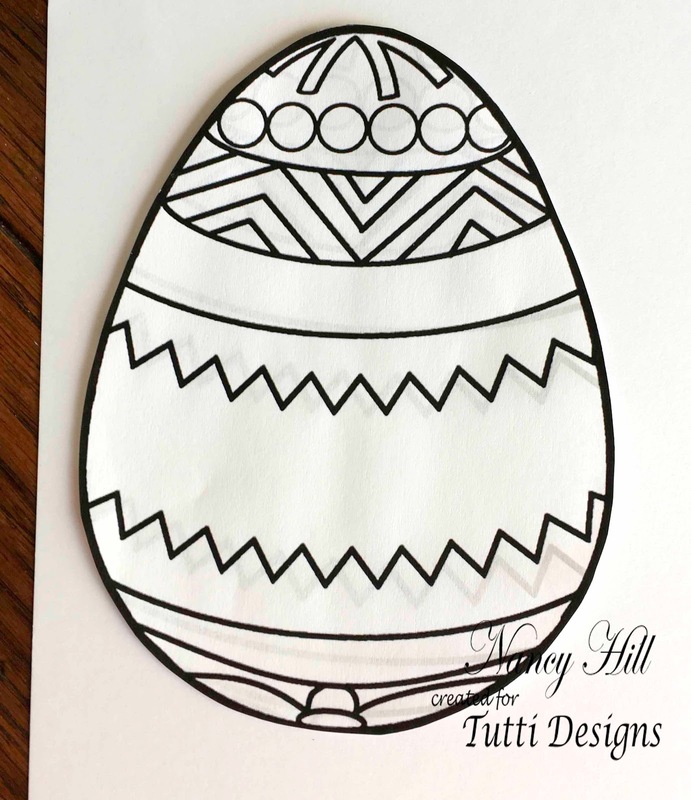 I traced the template twice on the back of the pattern paper and cut the two egg-shaped die cuts out. 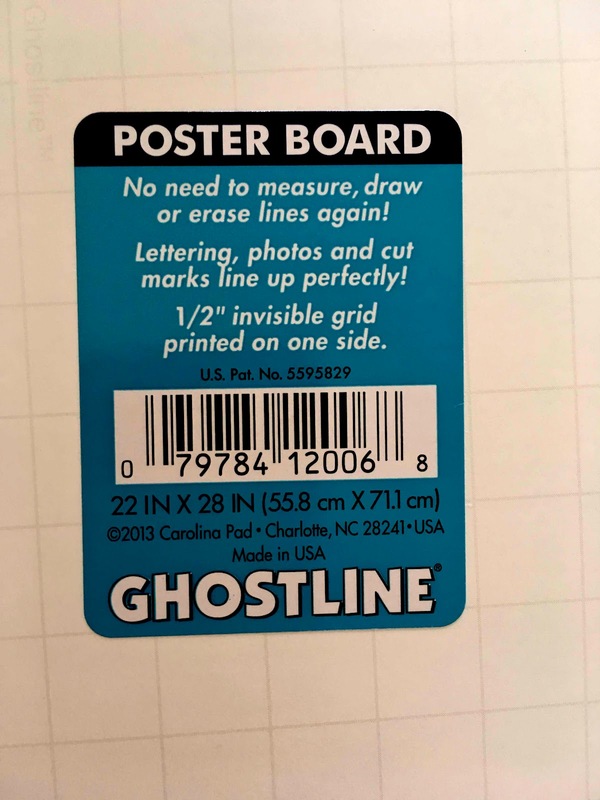 Since I make larger cards, I like using the Ghostline Poster Board. Since it is a heavy weight paper, it does not warp and I find it best for making larger cards. 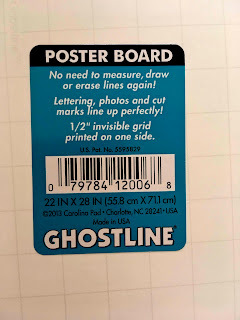 On the Ghostline poster board paper, the lines show only on one side of the poster board. I used the Ghostline side for the front and back of my card since it will be entirely covered when the card is completed. Since the inside card of the poster board doesn't show the lines, it is perfect for using as the inside of my card for stamping the sentiment and signing the card. I traced the template and overlapped it in the center to fold the card. Cut this out and score down the center and fold. First: I glued the one pattern paper on the back and cut the remaining pattern paper that over laps to part of the front of the card. 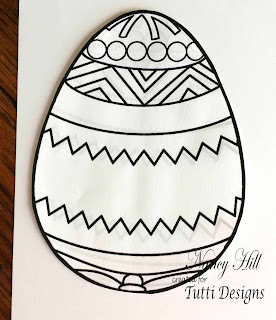 Second: I used 1/8" wide Scor-Tape to tape the elastic ribbon on the back of the egg-shape pattern paper and glue this on the poster board that will be the front of the card (see below). 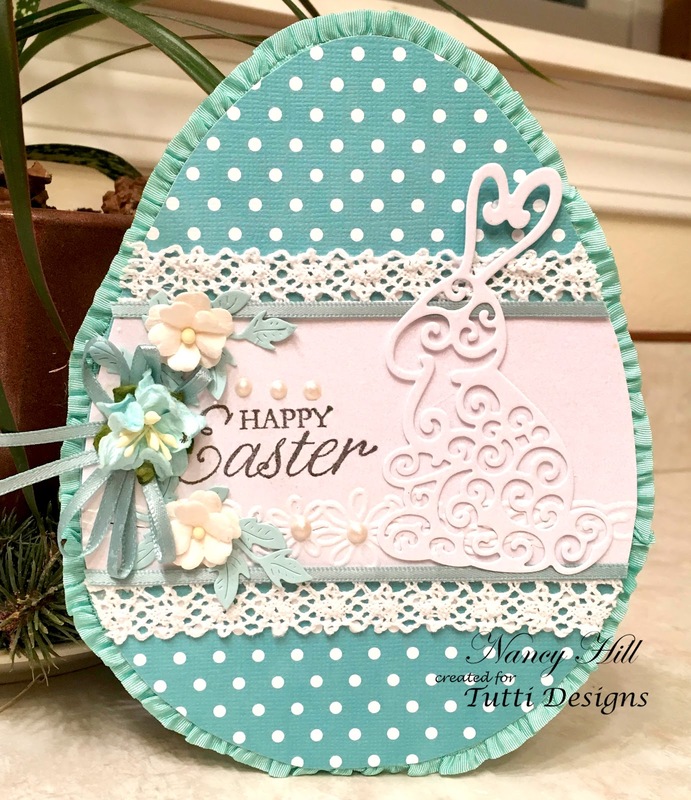 I cut a 2 1/2" x 5" white shimmer card stock and used my template to cut around the ends of this white card stock to fit on the egg. I embossed the bottom of the white strip with a embossing folder and stamped the "Happy Easter" and glued it on the card. 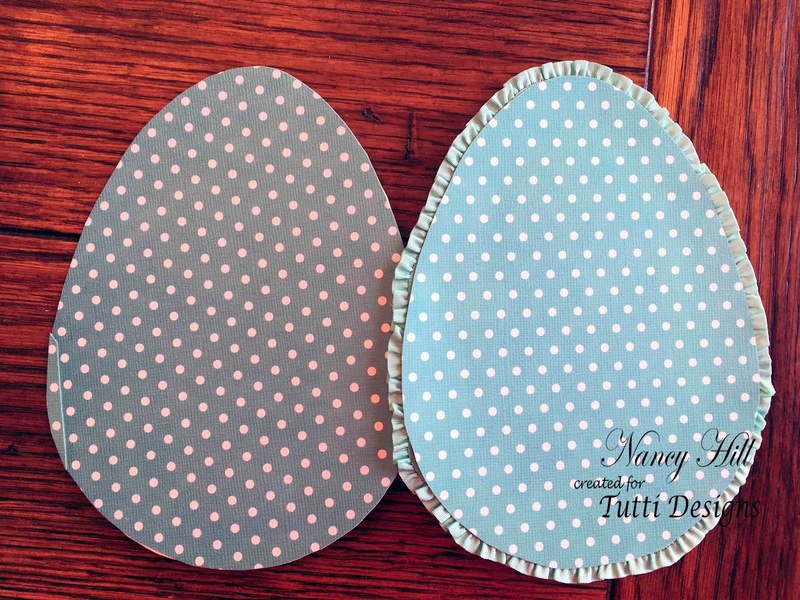 I used 1/8" wide Scor-Tape across the top and bottom of the white strip and taped the lace and ribbon across the egg. I used 1/2" Scor-Tape to tape my bow before adding the flowers and leaves. I glued the Tutti Designs Scrolly bunny on the card. 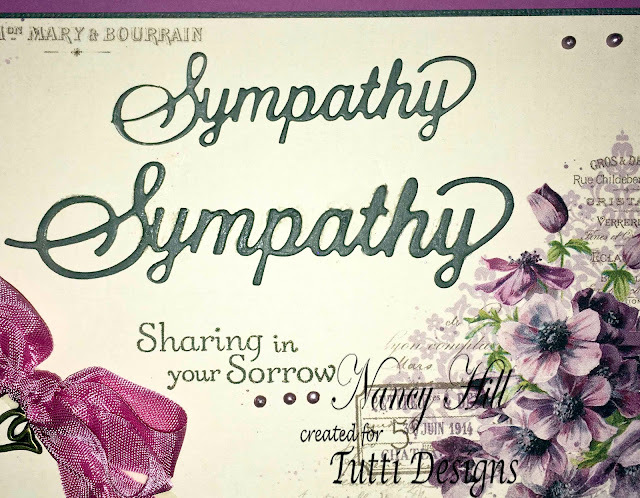 Last: I used NUVO Crystal Drops - Ivory Seashell for the embossed flowers and top of the sentiment. 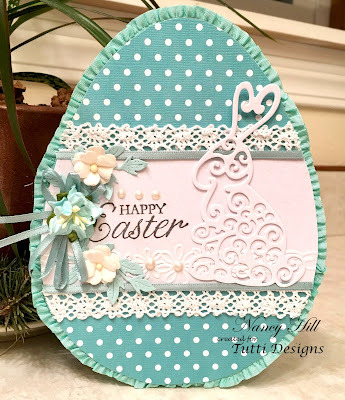 Now, this card is ready to be sent around Easter Time. 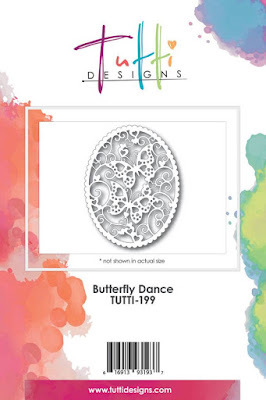 Click HERE to see the Tutti Designs dies or new dies in the January Release folder. 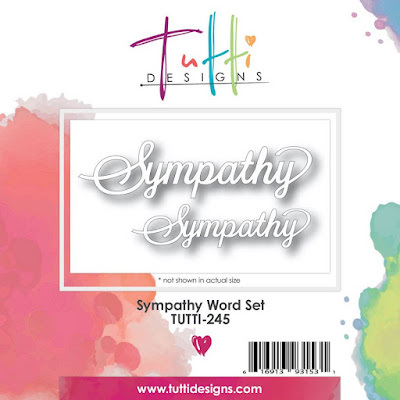 from the fabulous Tutti Designs Store. Today I've used the beautiful Butterfly Dance die from the November Release. 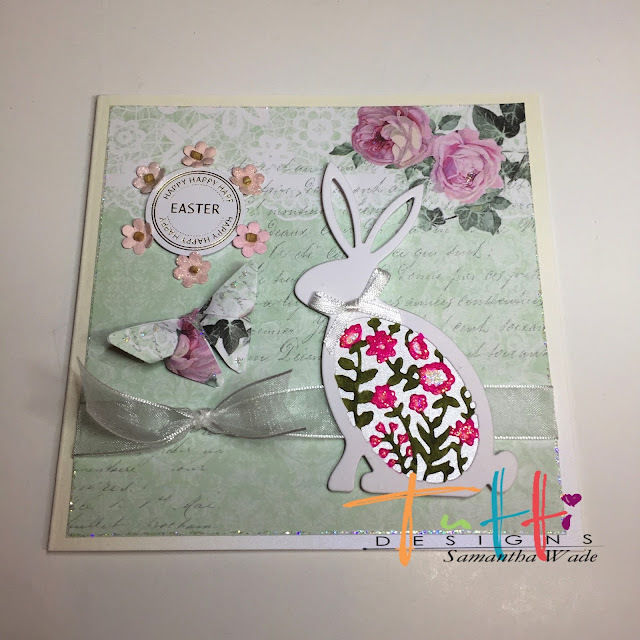 I knew I wanted to bring full focus to this beautiful die so I created a colorful panel to die cut from using Ken Oliver color burst. 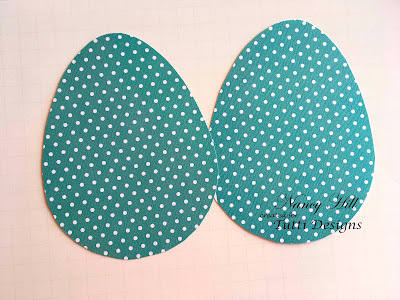 I was in a hurry (imagine that) and die cut my panel before it was dry, but I recommend if you use this technique that you wait awhile before die cutting ... makes the little pieces come out easier. Speaking of those little pieces that pop out and typically get thrown away ... be watching for those that can be used as an extra accent to your creation as I have done today. I am using Word Set - Welcome along with the Nesting Stitched Squares dies from Tutti Designs to create this Welcome card for a friend which signifies a new welcome to life actually. Die cut the bunny from white card. Not just an Easter Bunny can be used all year. Coloured all the detail with clean colour pens. 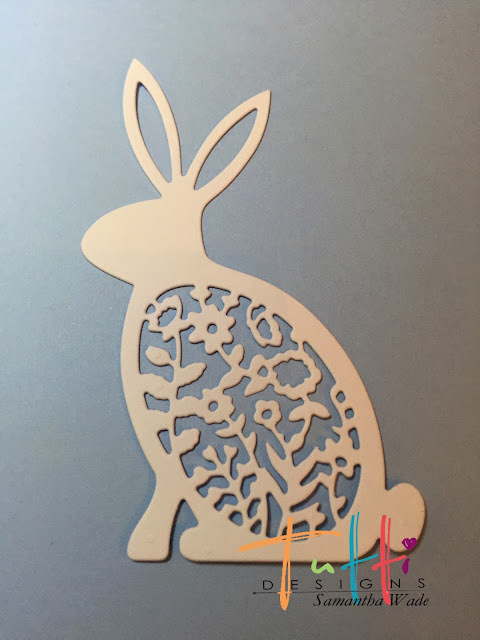 Then draw around the body of the bunny with white card and cut out a little bit smaller and glue to the back of the bunny. Plus a small bow. 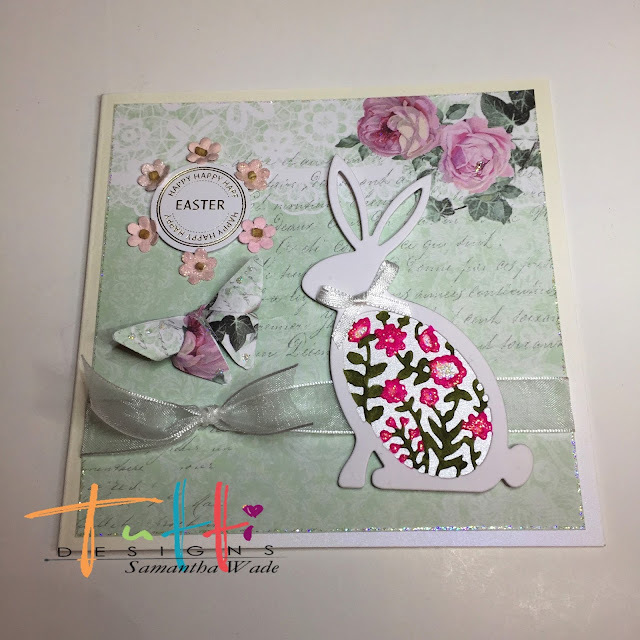 Layered the bunny with 3D foam pads onto a pretty background paper from Craftwork Cards, added a paper folded butterfly, glitter, ribbon and an Easter sentiment. 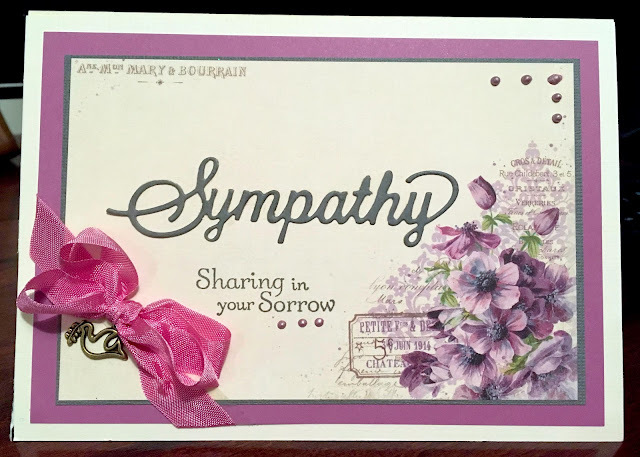 These dies can certainly be used for any wedding project, bridal showers or anything that shows how much you love someone or as I did, for a friend. Close Up of the details. the tiny black heart in the upper right corner was made by the November Release of the Heart Flourish. It is the center of the heart. 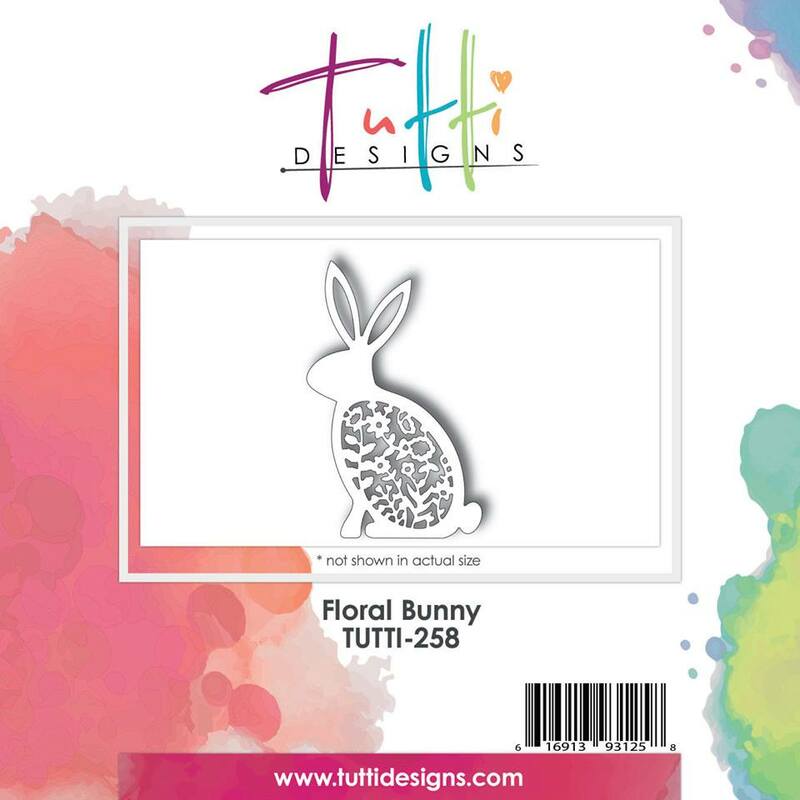 Valentines Day is coming up on us pretty fast and these dies give you so many possibilities for any occasion, weddings and more. 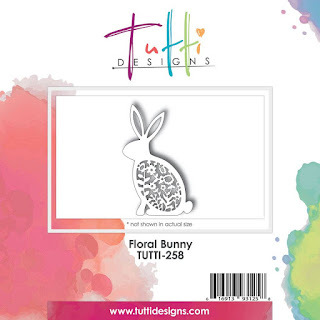 The January release is out now and you can get a jump start on those Easter Cards! It's right around the corner! Hello! 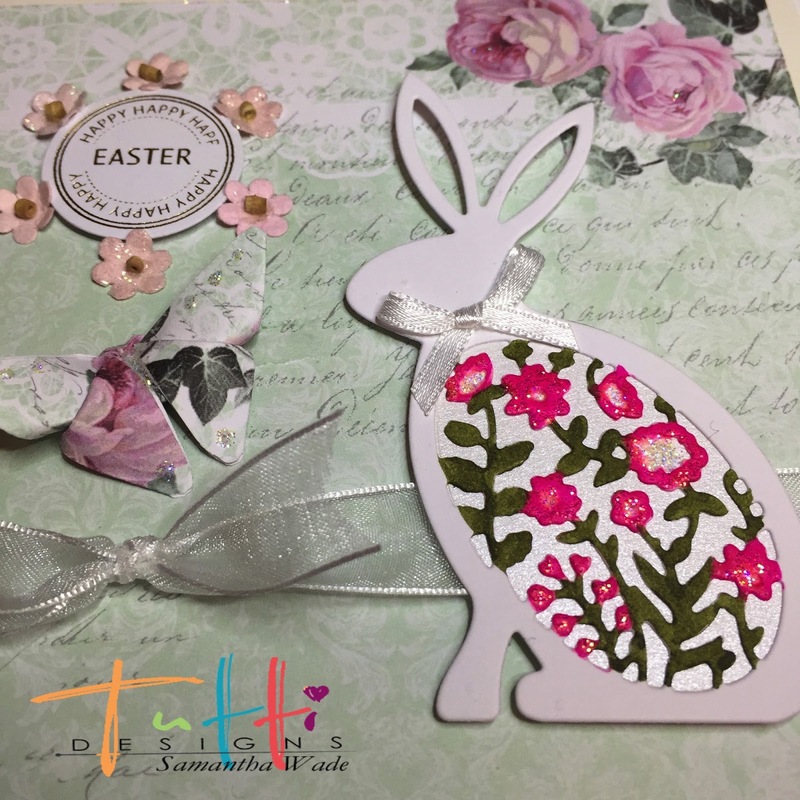 Autumn with you today to share a fun mixed media approach to using die cuts. I am absolutely in love with the Elegant Love Bird die! I wanted to give it a cool enamel of some sort, so first I embossed it with aqua blue embossing powder. Next, I used my Distress Crayons to give some highlights and shadows. I used teal and green. I still wasn't happy, so I lightly rubbed more Versamark ink onto it and applied copper embossing powder. The copper melted with the blues creating very unique effect, a verdigris of sorts, or copper patina if you will. 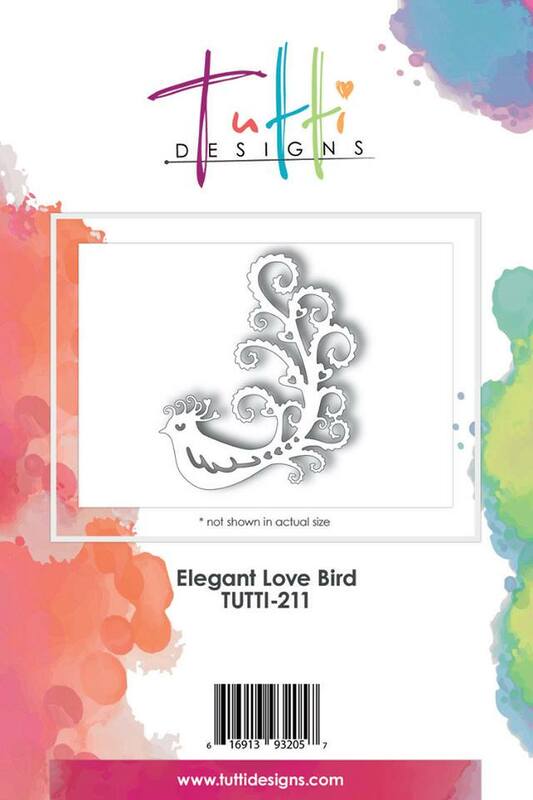 I layered with another Elegant Love Bird cut from metallic brown cardstock to create more depth. 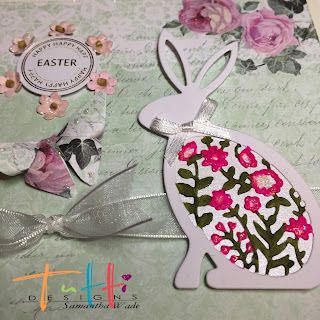 I used an embossing folder and kraft cardstock for the background. I applied Picket Fence Distress paint to the raised areas and then sprayed the entire panel with Perfect Pearls mist. I created a nest from shredded book pages and added some coordinating Prima flowers to finish it off. With Valentine's Day right around the corner and wedding season really not that far off, I decided to do a classic black, white & red creation that could be used for either occasion! Or a spouses birthday for that matter! I've used this beautiful Love Heart die from our November release as my focus today! But then after some rethinking, I thought it would be even prettier if I cut the hearts from the red die cut panel and adhered them to the white panel before mounting it to my black background. YES ... I like this idea even better ... what do you think? You could use just about any background die you have in your collection ... or simplify it even more by just using a solid black background as your anchor. A few little pearls ... or in this case Nuvo crystal drops, and your card is ready for giving. OH and I forgot to mention, I did POP UP my Love Heart by simply adding a little dimensional tape behind each heart and 2 narrow strips behind the word.